Best Buy! 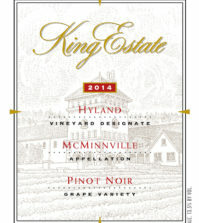 Oregon icon King Estate continues its interest in Washington state fruit with its consumer-minded North by Northwest brand, and they collaborate here with Four Feathers Wine Estates vineyards McNary in the Horse Heaven Hills and Soaring Eagle on the Wahluke Slope. Both sites are farmed by Tom Merkle, the Auction of Washington Wines’s Honorary Grower for 2017. The blend developed by King Estate winemaker Brent Stone is equal parts Merlot and Syrah with support from Cabernet Sauvignon (28%). There’s density to the nose of black cherry pie, cocoa powder and vanilla bean, which lead to flavors of creamy cherries, raspberry and cola. Pleasing tannins allow for a bright and juicy finish.